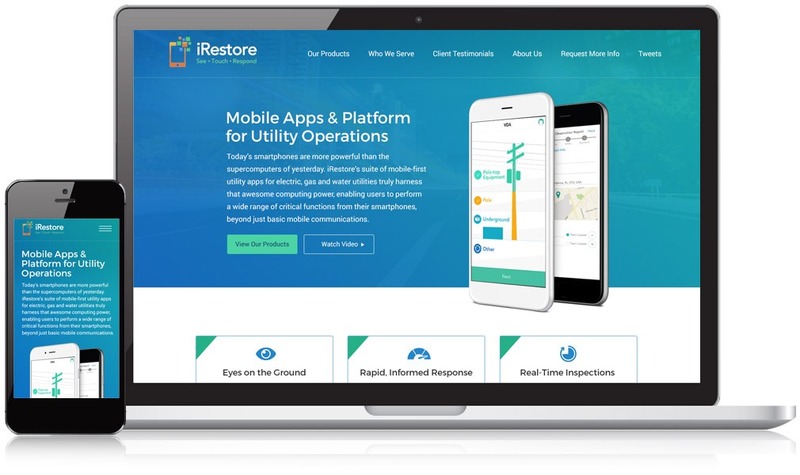 iRestore’s suite of mobile-first utility apps were gaining traction, popularized by major utility companies such as National Grid, Liberty Utilities, and Unitil. However, their current website did not accurately represent the growth in their business. iRestore reached out to Mannix Marketing for website design and SEO that would reflect the increasing popularity of their products in an easy-to-understand manner. In line with iRestore’s emphasis on minimal, user-friendly design, the new iRestore website focuses on strong visuals and iconography to tell the story of what iRestore is all about. Copy and photos are interwoven together for a strong image-based design that serves the growing demand for visual storytelling in websites. As a company that creates apps, the most important aspect of iRestore’s new website was building a powerful presence on both computers and phones. Our optimized, mobile-friendly design made iRestore’s new site extremely readable for all devices. When viewed on mobile phones, the navigation bar transforms into a side menu that makes the site look clear and crisp. By implementing SEO services and strategies, our website design increased organic traffic on iRestore’s site by a whopping 69%! iRestore now has more people than ever visiting their site to learn about the innovative products they have to offer.